This year is only the beginning of what might become another urban farm within the Hamilton landscape. The phrase, “It takes a village” could not be more appropriate for our project the Stinson Community Garden. 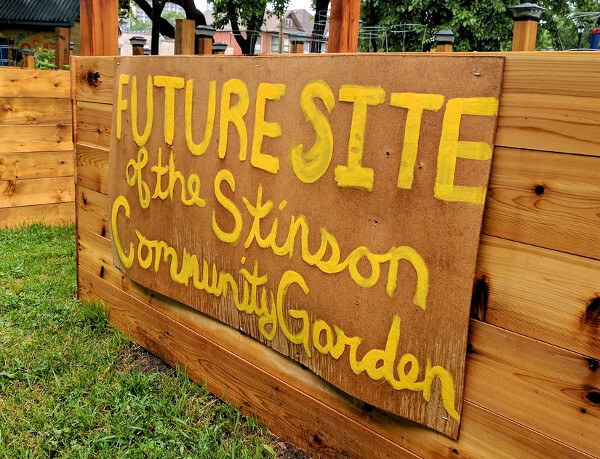 The Stinson Community Garden has long been a dream in the minds of local residents, but for a variety of reasons up until now, a community garden has never materialized. Although a chance meeting with Adam Chiaravalle helped galvanize the garden’s most recent incarnation, it was not a unique thought. Unfortunately, 49 percent of Stinson Residents do not have access to a yard or their own green growing space. Recognizing this need it was added to the 2012 Stinson Neighbourhood Action Plan (SNAP) [PDF] under item Community Garden in Carter Park (Goal A: Objective 2 Action A.2.1). 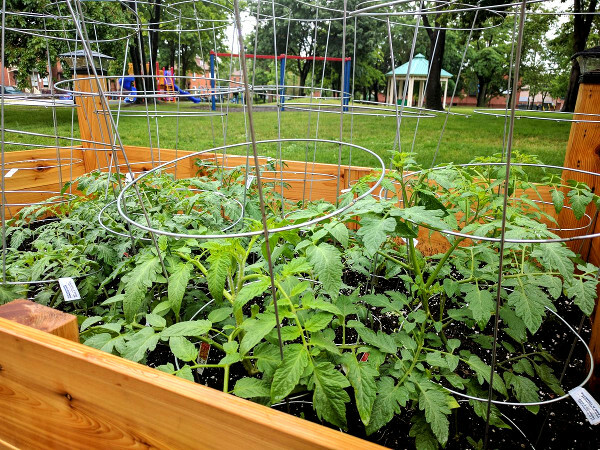 The inclusion of a Community Garden space was identified as a priority for the neighbourhood to help address food insecurity, provide fresh locally grown produce, and as an opportunity for residents to have a collaborative space in which to learn and grow. More importantly, Community Gardens, as a community building project, also inspire and unite residents. They become long-term investments in community that outlast those that build them. When I became co-chair of the Stinson Community Association, I reviewed the SNAP and found several items I believed could be moved forward. The community garden was one of those projects. Building on the experience of previous resident-based plans, as well as inspirational gardens across our community, this year a group of enthusiastic residents formed a committee. That committee begin planning on the design, construction and maintenance of a sustainable collective community garden. The theme of this garden was accessibility. The aim of the committee: to build Hamilton’s first fully accessible community garden. The garden, however, was not to be a space excluded from the park, rather integrated within the park as a collective space. Benches are to be added across the front six garden boxes, providing a bench seating area in the park. The pillar posts of the garden are equipped with LCD post lights to provide a beautiful night-time lumination experience. With the help of a Canada 150 grant, an art instillation will be added on the entranceway later this summer that will give residents a place to enjoy local art, even if they aren’t participating in the garden. As part of our model, beds are raised 0.84 metres (33 inches) off the ground and there are 1.2 metres (4 feet) between each bed for better mobility. The beds are equipped with Gardina quick-connect hoses, and a rolling hose cart for easy watering. Tools and access to the garden will be provided free of charge for the first two years under the collective garden model. The idea was to build a garden that could produce as much food as possible and distribute that food, first to those who participated in the daily gardening and then the surplus to be distributed to those in our community with need. Being a pilot project, we expected the first year to encounter many challenges, vandalism, animal invasion, theft and so on. So far, those challenges have not occurred. But the garden did not build itself. We received almost $3,000 in corperate in-kind donations. Lowes and Turkstra Lumber donated free delivery and our needed wood and tools at cost. Hamilton Building Supply donated filler triplemix and the gravel for our boxes, plus delivery free of charge. Premier Tech Home and Garden donated for the top layer of our garden high quality top soil and compost mix, and delivery free of charge. McMaster student volunteers came by to help build the garden boxes, dig them in, and line them with landscaping fabric donated by Hamilton Victory Gardens. Residents, not even those involved with the garden team, showed up in droves with wheelbarrows, shovels and strong backs to help move the ton of soil and gravel needed to fill the beds. In total we received almost $3,000 in in-kind donations and 175 hours of donated labour. This is in addition to the $1,500 small grant from the SPRC/Hamilton Foundation, the close to $2,000 donated from Ward 2 Councillor Jason Farr’s office, and $750 of the $1,000 Change Camp grant we received. With that money, we have forged long-term relationships with greenhouses (who are eager to supply next year’s plants free of charge), lumber suppliers (like Turkstra and Lowes) and Primer Home and Garden, who have all committed to continue to support the garden as it grows and expands. This year is only the beginning of what might become another urban farm within the Hamilton landscape. 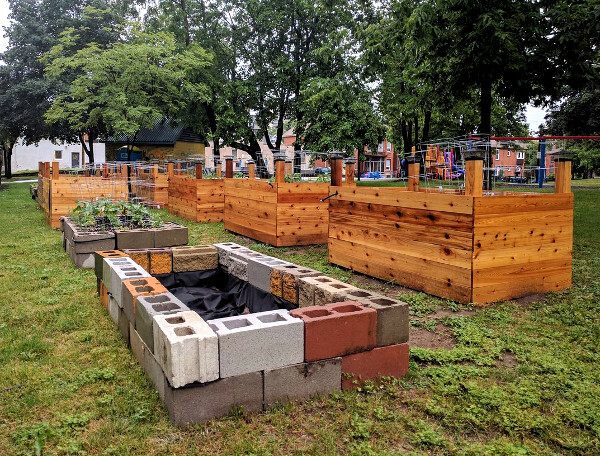 Before concluding this article it is important to mention the City of Hamilton, the Office of the Mayor, Councillor Farr’s office, the SPRC and the Neighbourhood Action Strategy, all of whom contributed immeasurable logistical support in making this garden a reality. It truly takes a village.